I recently got an email from LinkedIn. 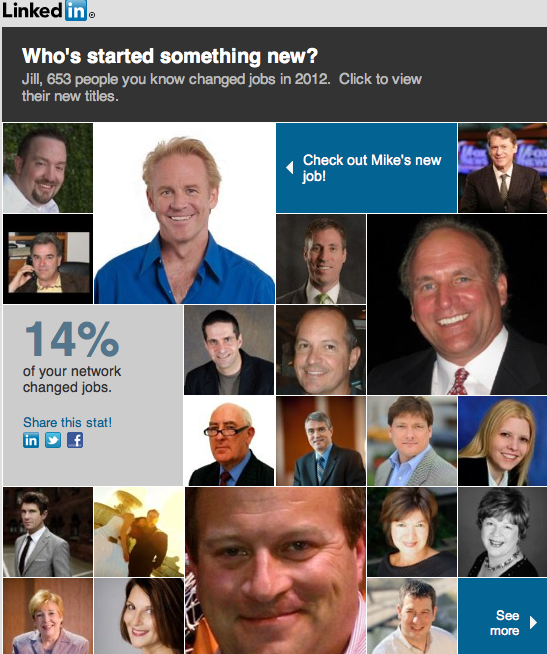 The subject line read: "See Mike O'Neil's new job, plus 652 other changes in your network." Curious, I opened it. At the top I read, "Jill, 653 people you know changed jobs in 2012. Click to view their new titles." And there, smiling out at me, where a whole slew of familiar faces. When I clicked on a photo, it took me right to that person's profile. Here's the deal. People in new positions create sales opportunities. It's a major trigger event*. Think about it. Happy clients who go to new organizations can replace their existing vendor with your products/services. New decision makers within your customer base suddenly make you vulnerable to competition. Prospects who loved you but couldn't get their companies to budge from the status quo now have a fresh chance to bring you in. When you see changes like this, take immediate action. But don't wait for the year-end LinkedIn summary. Keep your eye on their status updates so you can be a first mover. You can also create a "Saved Search" for key positions you regularly contact. And, you can use LinkedIn Signal to ensure you don't miss an important change when it happens. You now have a bonafide excuse to re-connect with people you haven't talked to in a while. Congratulate them. Open the door to new conversations. This is a trigger event that can speed up your sales cycle significantly -- or prevent the loss of a good customer. *Click here to get my free ebook on Trigger Events.